We pick out five talking points from Liverpool's 2-1 win over Tottenham at Wembley Stadium as Jurgen Klopp's side maintained their perfect start to the season to stay top of the Premier League. 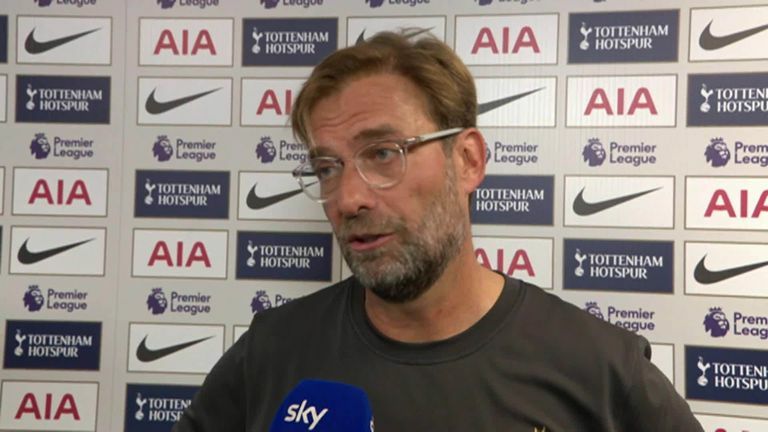 Klopp was well aware of the challenge facing Liverpool at Wembley having been beaten 4-1 in the same fixture last season. Liverpool were two goals down after just 12 minutes on that occasion, but this time they were far better prepared. They had the ball in the net after 45 seconds, and while it was ruled out for offside, it set the tone for what was to follow. Liverpool looked menacing from the start and it was largely thanks to how they were set up to get at Tottenham, with Klopp instructing his side to exploit the space behind full-backs Kieran Trippier and Danny Rose. Sadio Mane and Mohamed Salah sprinted into those areas at every turnover, enabling Liverpool to outnumber their opponents on numerous occasions. Klopp's side won the midfield battle, too. Naby Keita, James Milner and goalscorer Georginio Wijnaldum did not have as much of the ball as Harry Winks, Eric Dier and Mousa Dembele, but they offered far more intensity and penetration. The pressing was too much for Spurs; so too was the speed and directness of their forward passing. In his post-match interview with Sky Sports, Klopp described it as Liverpool's "best performance of the season". Pochettino rejected the notion that Kane had been playing with fatigue during his pre-match press conference, but this was another subdued showing which added weight to the argument. The 25-year-old scored twice in this fixture last season but he struggled to get involved this time around, making it four appearances for club and country without a goal. He was not helped by poor service, in truth, but the statistics were troubling nonetheless. According to Opta, Kane had just 22 touches over the course of the 90 minutes - his second-lowest total in the Premier League since the start of last season. For the fourth time this season, he only mustered two shots on goal. That only happened twice in the whole of the last campaign. Milner was not expected to feature prominently this season following the additions of Keita and Fabinho during the summer, but he has started every Premier League game so far and his strong start to the campaign continued with a man-of-the-match performance against Spurs. Milner turns 33 in January but his tireless energy remains. According to Premier League tracking data, he covered just shy of 13km at Wembley - more than any other player on the pitch. At 8km/h, he also registered the fastest average speed. Milner applied constant pressure, making more tackles (five) than any other player and helping Liverpool win possession in dangerous areas. Milner shone with the ball, too, making more passes in the opposition half (32) than anyone else and producing some dangerous deliveries. According to Opta, he made four crosses and created three scoring opportunities. He may not attract as many plaudits as some of his team-mates, but no one was more influential at Wembley. Michel Vorm came into the Tottenham team in the absence of the injured Hugo Lloris, who accepted a drink-driving charge earlier this week. The Dutchman had not started a Premier League game since January and his return to the side was not an occasion he will remember too fondly. There were some fine saves, not least from Keita and Salah in the second half, but he was partly at fault for both Liverpool goals. For the first, he failed to get any distance on his punch before the ball fell to Wijnaldum to head home, and for the second his failure to gather the ball as it ricocheted back off the post allowed Firmino to stab home. Vorm was not helped by some of the defending around him, but with Lloris expected to be sidelined for three weeks, his errors will not fill Pochettino with confidence for Tottenham's upcoming games - starting with Champions League rivals Inter Milan on Tuesday. Virgil van Dijk underlined his value to Liverpool with another commanding performance in the heart of their defence. Erik Lamela's late consolation goal ensured there was no fourth clean sheet of the season for Liverpool, but the towering figure in the middle hardly put a foot wrong. Van Dijk made more clearances (five) than any other player on the pitch but the most impressive aspect of his performance was some of his covering defending. After 12 minutes, he was quick and alert to intercept a dangerous pass over the top from Danny Rose, and there was another example when his centre-back partner Joe Gomez was pressed into a mistake shortly after the break. "Van Dijk has made such a difference in that defence," said Sky Sports pundit Jamie Redknapp. Kane, who hardly had a sniff all afternoon, would testify to that.